Welcome ictQATAR’s Open Source Analyst Aysha Siddique to Digital Qatar! She shares her insight on the how to battle the growing problem of e-waste. Many of us in the Net –generation are early adopters of new technology as we use and accumulate the rapidly developing ‘best, latest, and coolest’ technologies and inevitably find little or no use in our old devices. For instance, I looked around my room and found three mobile phones, two laptops, two iPods, speakers, and hair dryers that I currently have no use for. While some of us are creative in finding new uses for old technology, most others end up housing a graveyard of e-devices in some corner of their homes. This applies to about 68% of consumers who stockpile old or unwanted e-devices at home, according to Electronics Take Back Coalitions’ facts and figures. E-waste (or electronic waste), defined as the refuse created by discarded electronic or electrical devices or their parts, is the fastest growing waste material in the world and also the hardest to dispose of as they are made up of toxic substances like lead, copper, cadmium and so on. 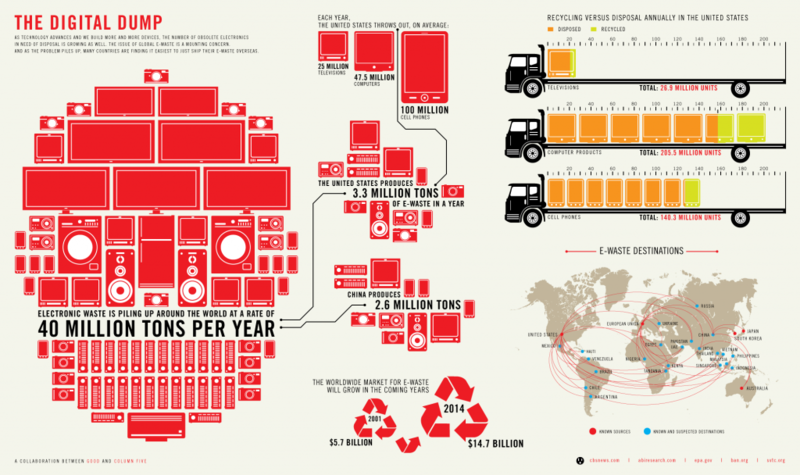 Below is an interesting infographic I found on e-waste from GOOD magazine which reveals that a shocking 40 million tons of electronic waste is produced every year. How is the MENA region handling it? Even though we are relatively new to the e-waste phenomenon, the rapid economic growth in the last few years makes our contribution to e-waste substantial, thereby forcing the region to look into and draft policies for handling e-waste. 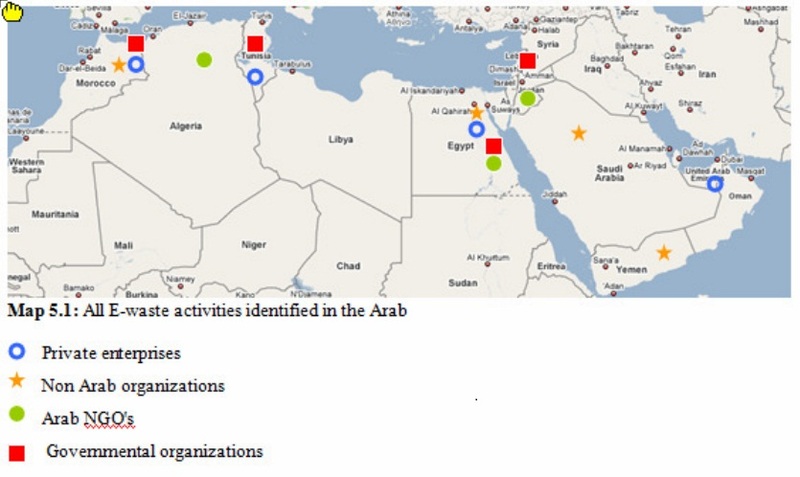 The map below (taken from the presentation, “E-Waste management in the Arab Region: Status and Opportunities” by Hossam Allam, Ph.D.) shows all the e-waste activities in the Arab region. Tunisia is leading the way, having developed a legal framework and an e-waste collection and recycling facility with a capacity of 1000 tons/year; Impressive. News reports from June 2010 say that Qatar is drafting an e-waste policy, and Q-Tel and Vodafone are already at the forefront with their e-waste management programs. With Vodafone’s “Hand It On” program, you can hand in your old mobile phone and get a 10% discount on a new handset. Q-Tel has an e-waste recycling program in which e-waste donors are rewarded monthly with fancy raffle draw prizes. So, I can ‘dump’ my old phone and get a discount on a new phone or win a Blackberry? That sounds really good. J Q-Tel also organized a ‘Big Drop’ day in August 2010 where you could dispose of larger e-waste items such as televisions, refrigerators, PC’s, printers and basically, “anything with a cord,” and gathered 4 tons of e-waste! On a global scale, GreenPeace International is campaigning to get electronics companies to take ‘cradle to cradle’ responsibility for their products, i.e. remove hazardous substances from their products and be responsible for recycling them. For example, users campaigned against Apple to remove toxic chemicals from their iPod which led Steve Jobs to change Apple’s policy and move towards a Greener Apple. It’s a small change, but nevertheless an indication of the power of consumers. Are you doing your part in properly disposing your e-waste? Drop off your old discarded electronic and electrical equipment at Q-Tel e-waste drop off stations. Exchange your phones at Vodafone. Sell your old devices that may still have value for others. If you are a company, you may think of partnering with Al-Haya, which is the only approved e-waste collection service provider in Qatar. I’ll be waiting for the next Q-Tel e-waste drop-off day to make sure that I clear up the growing tech graveyard in my room. Starlink Qatar, a subsidiary of QTel, also has a phone recycling program and Starlink actually compensates people for old phones too. They give a voucher of (generally a very less value) in exchange for an old phone. Nice Article. “Hand It On” program is a nice program. Personally, I do feel that High-Income people and Youth do waste more then the opposite as they are effected more with the advertisements. Also, they want the new. My small brother always visit Apple web site to know their latest products and then ask me to buy to him. Distribute the electronic items inside the country or provide it to the country with low income is nice idea. Also, organizing with international organizations to handle the distributions will make some people happy. I have something to say about the report. I believe some are trying to greenwash the idea of being green of environmentalist or any other type of label. My question to the writer, how green initiative by Vodafone is considered a “WOW” conept towards green!? I mean think about it, you were mentioning the shocking rate of 40 million tones of electronic waste generated annually. Then how we are reducing the waste if we give the consumer a new device!!!!? This strategy is so misleading to the public and its mainly 100% business rate kind of deal. I work in this field and never go to that direction by munipulating the public and never educate them about the negative impact of electronic waste on environment and health. The biggest challange – as in my opinion – is how to reach to people’s hearts and minds and develop the good well initiative in within them.